John Culberson’s record shows he is more focused on his personal hobbies than protecting families across this district from flooding. Houston, TX – Lizzie Fletcher today released her fourth ad of the general election titled “My House.” The ad focuses on John Culberson’s nearly two-decade tenure in Congress highlighting his failure to protect Houston families that have faced repeated flooding and proactively fund flooding infrastructure projects, while instead pushing increased funding for projects that are of interest to him. “My House” details how Culberson’s personal interests have taken priority over local flood mitigation. Families included in the ad each experienced multiple instances of flooding in their homes and businesses, from Tropical Storm Allison, to the 2015 Memorial Day Flood, to the 2016 Tax Day Flood, to Hurricane Harvey in 2017. Taking office in 2001, the same year Tropical Storm Allison hit Houston, John Culberson has repeatedly acted against the interests of Houston families. 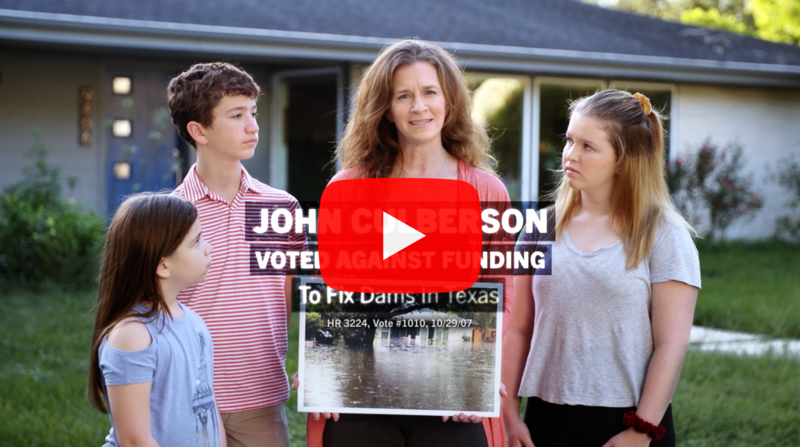 The ad highlights two of his votes: against funding to fix state-owned dams (in 2007) and against Federal Emergency Management Agency (FEMA) funding that would have allowed states like Texas to prepare for floods (in 2013). Instead of proactively funding disaster preparedness and infrastructure improvements, Culberson prioritized a project for one his personal interests: a telescope in Chile. In fact, he pushed for $74 million more than was originally requested. If John Culberson understands federal infrastructure projects, and the intricate funding structures, why has he chosen to exact his influence to fund a Chilean telescope and travel to Europa, rather than to fully fund and complete much-needed projects to update our bayous, bridges, and detention areas? My business flooded in 2001. Storm Allison … but he’s had different priorities. But Culberson voted against funding to fix dams in Texas. And against FEMA funding to prepare for floods. Lizzie is the Democratic nominee in Texas’ 7th Congressional District, a district that Hillary Clinton carried in the 2016 election. CNN, Sabato’s Crystal Ball, and Daily Kos have listed Texas’ 7th Congressional District as a key “toss-up” race in their 2018 election rankings. Lizzie is the first woman partner at AZA, a Houston law firm, where she has represented businesses and Houstonians from all walks of life, helping them find solutions to complex problems. She has been recognized by her peers as one of the ‘Best Lawyers in America’ in U.S. News and World Report. She co-founded Planned Parenthood Young Leaders, and currently serves on the boards of directors for Writers in the Schools (WITS) and Open Dance Project.